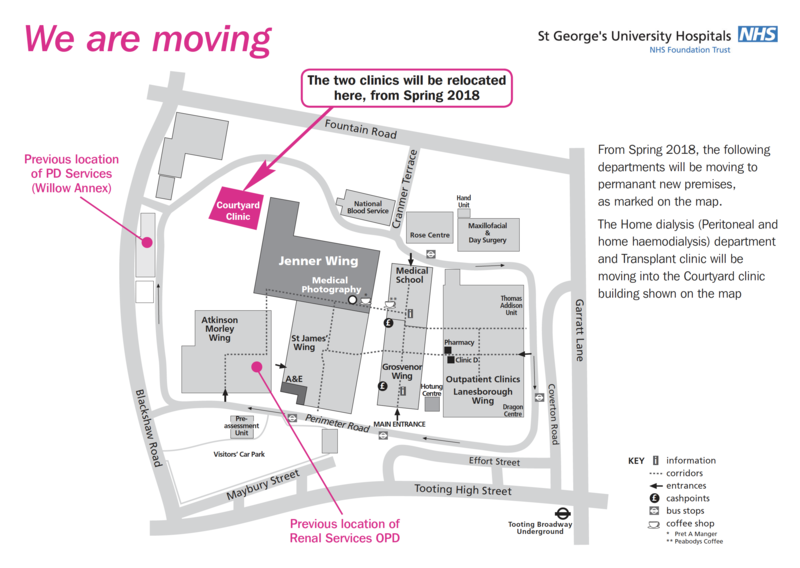 We are pleased to confirm that the renal unit is consolidating its clinics and outpatients into one location. 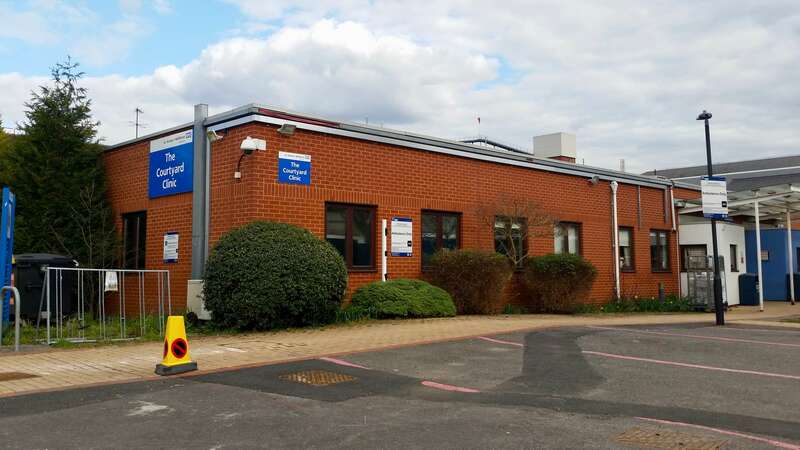 From Monday the 9th April, all renal outpatient clinics except the general nephrology clinics will be relocated to the Courtyard Clinic building. This is part of a broader plan to re-consolidate services following the closure of the Knightsbridge wing in 2016. This article will provide you with details of the clinics moving, location and facilities available and further intentions for other services, as well as the Association's views on the change. We are on balance positive about the move and we hope to post pictures of the new facilities in the near future. The General Nephrology clinic will remain in the ground floor Lanesborough in Clinic A for the time being. A brief outline of the changes can be found here on the hospital website. You should also have received a letter from the hospital explaining these changes. The Courtyard Clinic is located on the North West corner of the Perimeter Road of the main hosiptal site at St George's Hospital, Tooting. It is next to the current dialysis trailers and the ambulance drop off point at the entrance to the old Knightsbridge Renal unit. The position within the hospital site is shown in the map below. Click the map for a printable or downloadable version. Exit from any hospital entrance/exit and follow the Perimeter Road round as shown on the map above. The closest exit is in the medical school building at the rear of the main Grosvenor Wing. There are currently no changes to bus options although staff are investigating whether patients can make a request to the drivers of the 493 and G1 buses to stop outside the courtyard clinic as they drive around the Perimeter Road. For other bus and public transport options please visit the St George's Hospital website. If you are arriving by car and dropping off a patient, enter the Perimeter Road and travel clockwise around the Perimeter Road. The Courtyard Clinic can be found on the right hand side just past the old Knightsbridge Wing (boarded up) and just before the dialysis trailers. There is plenty of space to drop-off within a few metres of the entrance but do not block access for ambulances that will be coming and going. The closest entrance is by Ingleby House on Blackshaw Road, adjacent to the Willow Annex. If you are parking you will need to continue around the Perimeter Road and park in the usual patient car parks of Atkinson Morley or Maybury Street (You will need to exit onto Blackshaw Road and turn left for the Maybury Street car park entrance). The St George's Kidney Patient Association has been arguing for a single facility to house renal services that is fit for 21st century medical care and treatment. This move is, on balance, good news. It represents a significant increase in space from the current 5 rooms to 10 that are provided for renal outpatient services. A dedicated waiting area will also be available for renal patients as well as a small waiting area for transplant phlebotomy (bloods). Some nurses will have office facilities within this area. There will be a new training facility for home dialysis patients, re-establishing the facility lost when the service left the Knightsbridge Wing. 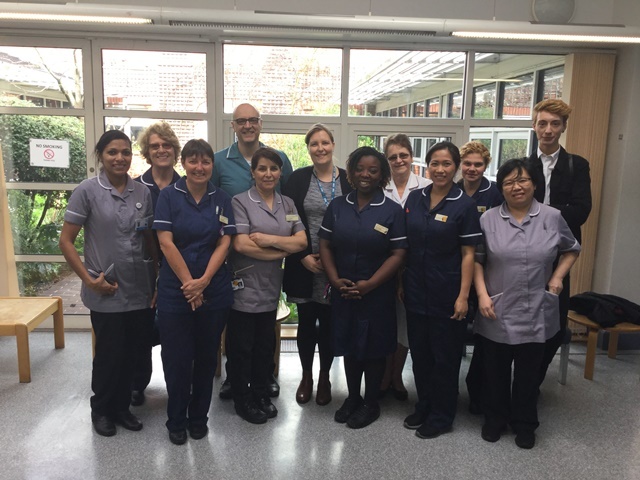 The renal services moving will benefit from the facilities of a modern building that has been refurbished with new decor, flooring, heating and furniture. More renal outpatient services will be colocated making cross-working and support between the different renal unit teams more efficient and effective. There will be more space for most outpatient clinics and services. There is further scope to expand within the building (subject to budgets and an agreement for the relocation of some administrative services). No procedures, such as biopsies or venus access work can be performed at the location. These will still need to be performed elsewhere. For most of this year at least, there is no funded plan to replace the dialysis stations outside with a permanent facility within the building. There is no plan to bring inpatient (the ward) services together with outpatient clinics and services. Unless the old Knightsbridge Wing is demolished and a new building is built in its place there is no option available. Any such plan would be years away and involve 10's (possibly 100's) of £millions. There is currently not even any funding agreed to demolish Knightsbridge Wing. Staff will still have to travel distances across the hospital to reach their offices and the ward. It is essential that an access solution is found to the main hospital buildings. Ideas are still being reviewed but nothing is settled yet. The dialysis trailers are temporary facilities and are due to be removed within the next year. The hospital is reviewing various options that include the siting of a service within the Courtyard Clinic. At present nothing is funded, approved or decided.